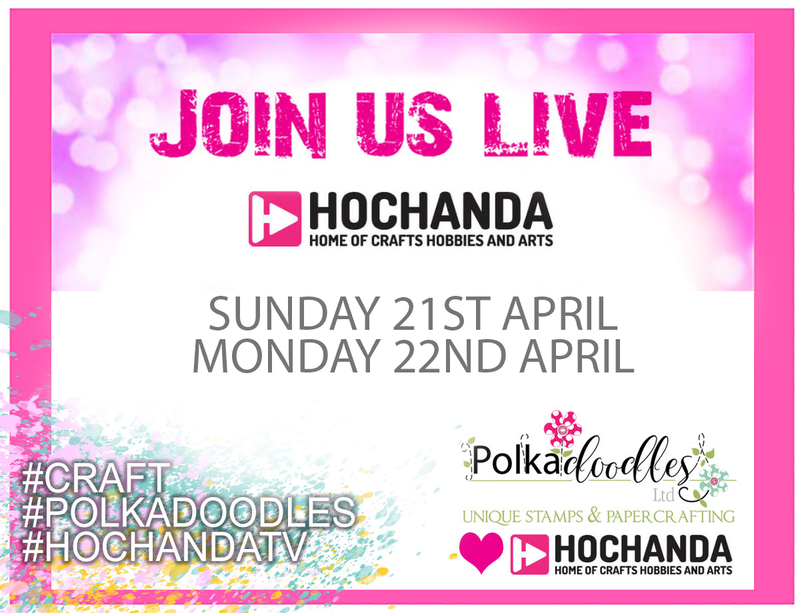 Yes, we're back on Hochanda TV this weekend with a selection of new products and some old favourites you might not have seen before, so tune in and watch us Sunday at 4pm and Monday at 10am to find out what's going on! Closing date for entries:19th April, Noon. 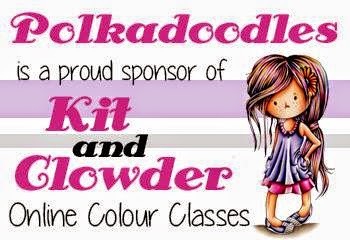 PLEASE REMEMBER - ONLY 2 ENTRIES PER PERSON! 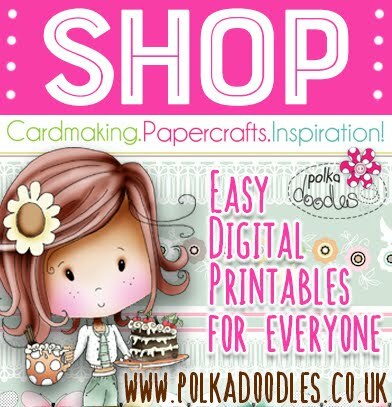 Don't forget to check out the Polkadoodles store this week - we have a brand new collection in stock and it's selling fast so don't miss it! 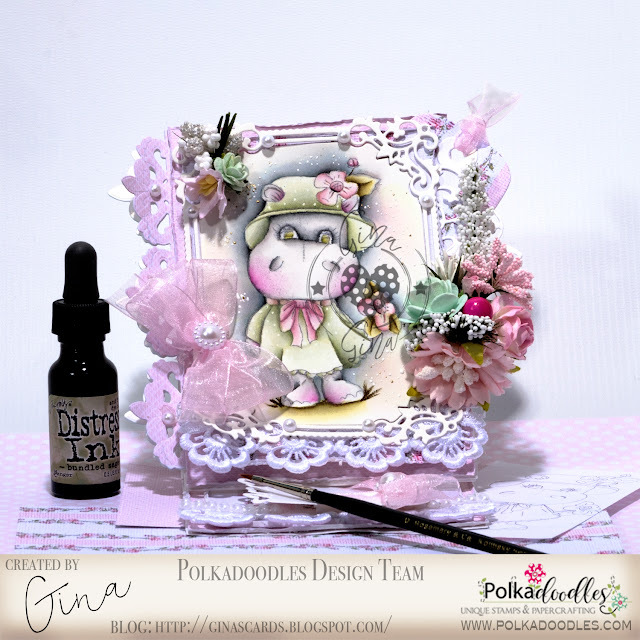 Gina - This time I have coloured up the adorable Helga Hippo - Flower Girl and teamed her up with papers from Octavia Moonfly Paperholic collection. 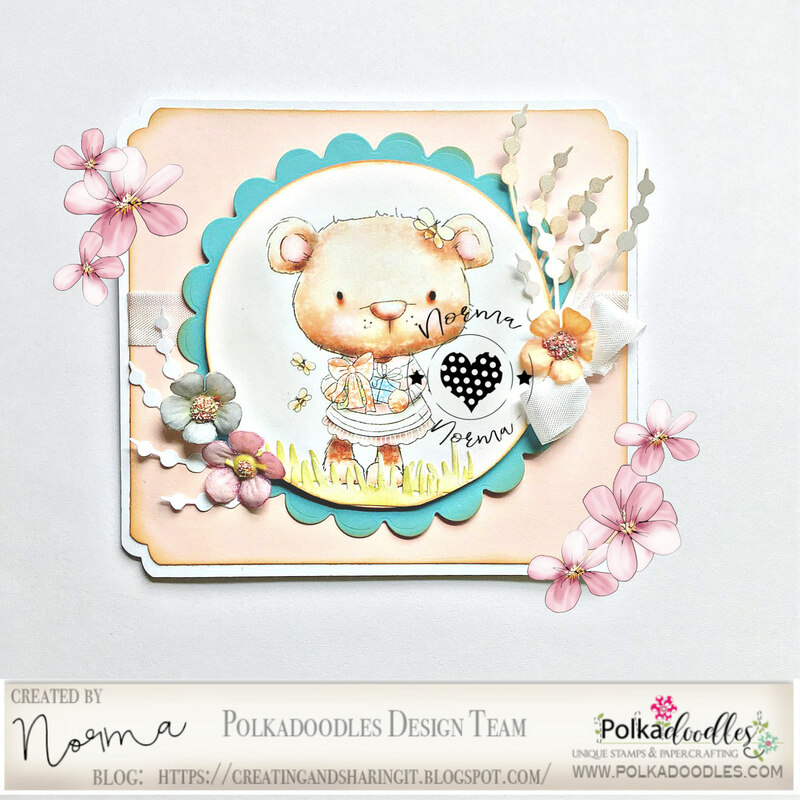 Norma This week I made a card using on of my favorites digis from Polkadoodles, is called Bella bear gift and I think is just adorable. 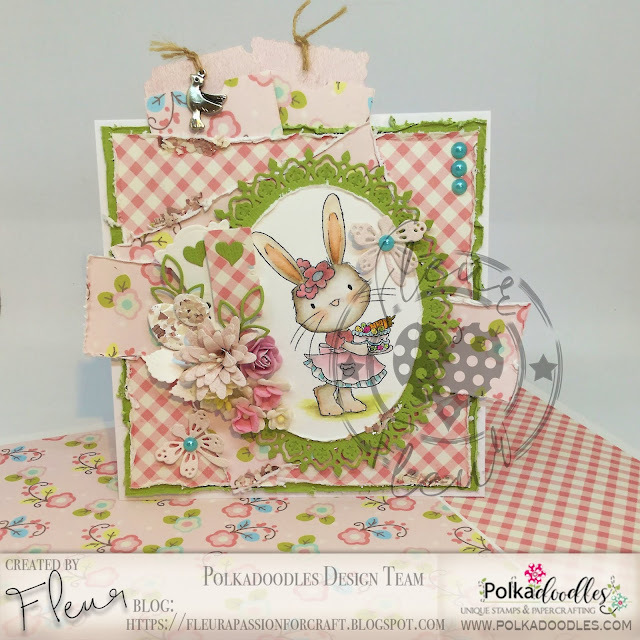 Fleur for my card this week I have sweet "Bunnita" from the Fuzzypuffs collection. 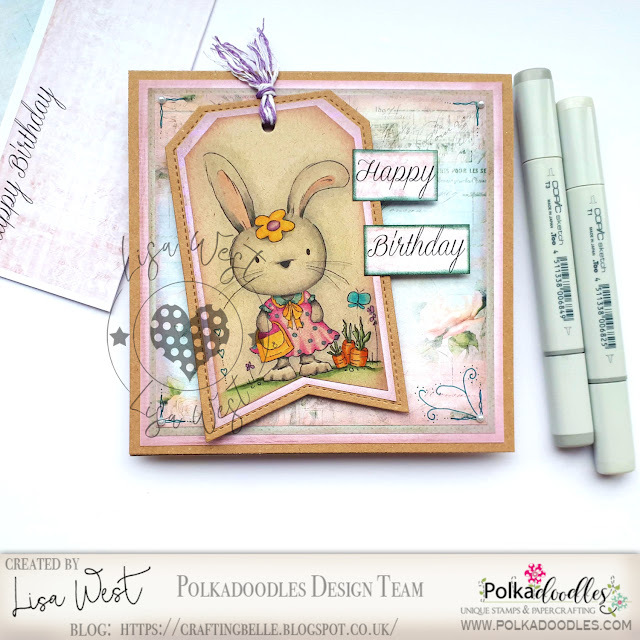 My papers are from "Winnie Celebrations 2" and the sentiments are from "Winnie Sugar Sprinkle"
Ann-Marie for my make this week I chose to use a little fox image and a fence image and laid these on top of a pre coloured background from the Rose Budd collection. I printed the image out and then coloured in the fox and fence with my copics. I also used papers from Winnie Fruit Punch paper heaven 1 and Winnie Sugar Sprinkles paper heaven 2. Gorgeous ideas for Spring, arent they adorable?! Congratulations! Please email us HERE, quoting the following code PD0wk014001 to claim your prize of $10 worth of downloads from the digi store. Claims must be received by 29/4/19, please refer to Challenge rules at top of blog. Please email us HERE, quoting the following code PD0wk013001 to claim your prize of $10 worth of downloads from the digi store. 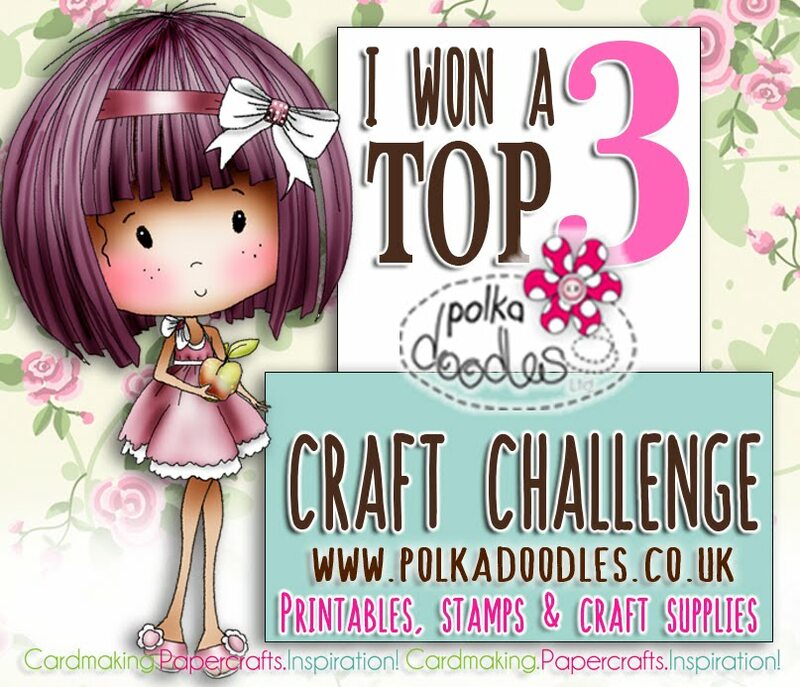 Congratulations to all of you and thankyou everyone for entering our challenge, we love to see what' you've made every week and as always it's difficult to only choose 3 favourites. 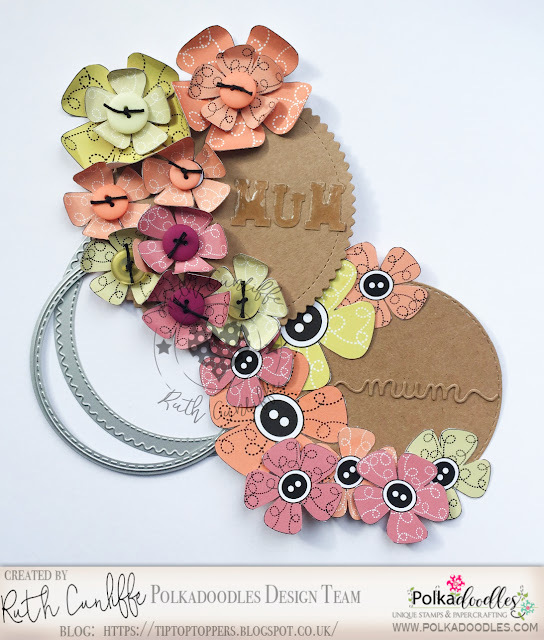 So let's see what the Design Team have made for us, with Easter and Mother's Day in the US coming up we are showing you lots of floral themes with projects that aren't just a card for a little twist of inspiration if you're looking to make some little gifts this month...enjoy the inspiration. Beata I made a tealight for candles for myr mum. I used Winnie Sugar Sprinkles Springtime Desigh Sheet 3 and Helga Hippo Paper Heaven 1. I added some extra flowers and raffia. Nelly ....My project this week is using Flowers and foliage digi kit, Embellishments and sentiment was taken from The Picknix collection, and the backing papers was taken from The Pretty Tuff CD the flowers have been edged using Distress inks. 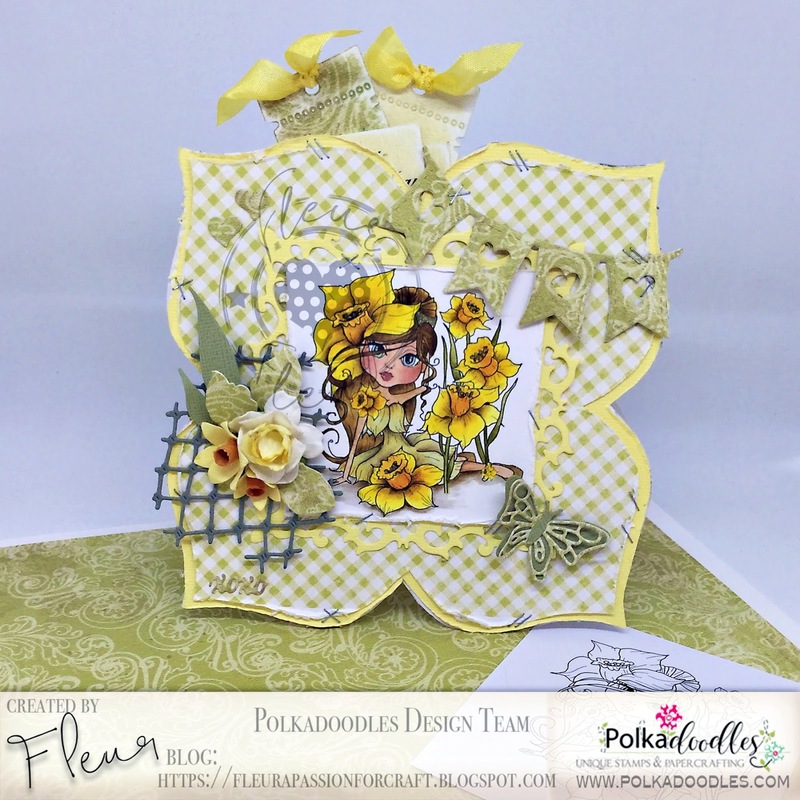 Judy: My project for this week is a Post-It Note Holder. I used digital flowers and papers from the Rose Budd Collection. I also used a Fanciful Circles Dies as the wreath for the flowers. 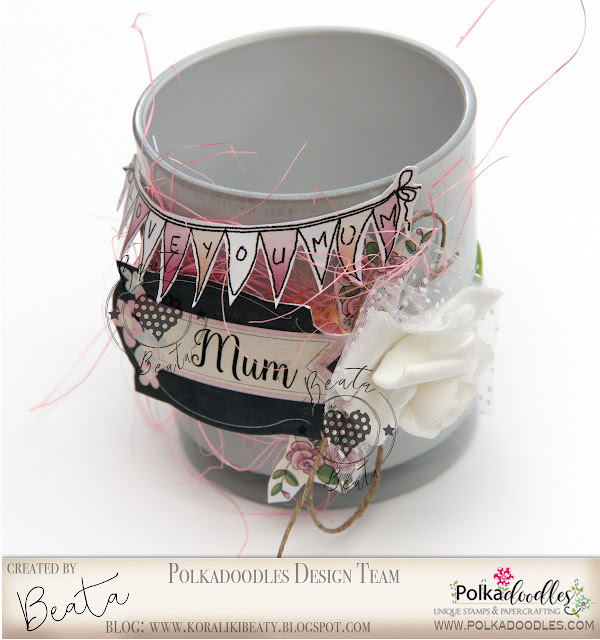 A little ribbon, glitter glue and twine finish the design. 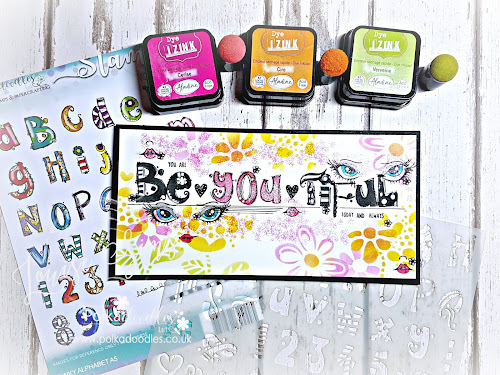 Ruth - I've used flowers printed from the Sugar Birdies CD - I've had these in my stash for quite some time and I'm trying to use up what I already have! I've used one of the Fanciful Circles dies and also a Stitched and Pierced die. Fabulous projects from the whole team, superduper job this week! Claims must be received by 22/4/19, please refer to Challenge rules at top of blog. 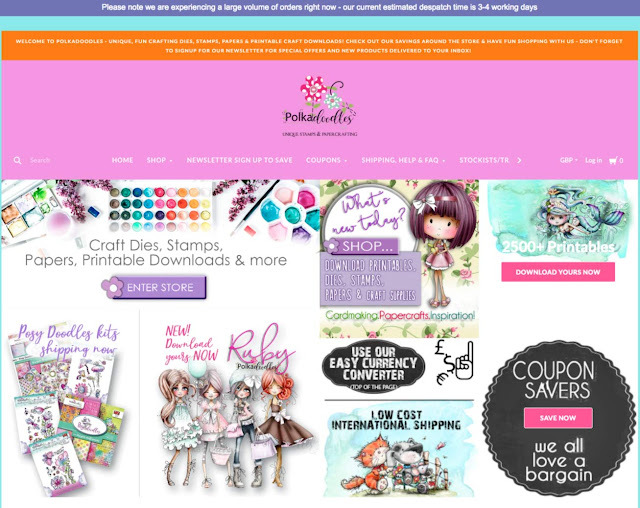 Please email us HERE, quoting the following code PD0wk013 - 123 to claim your download voucher from the digi store. Closing date for entries:12th April, Noon. 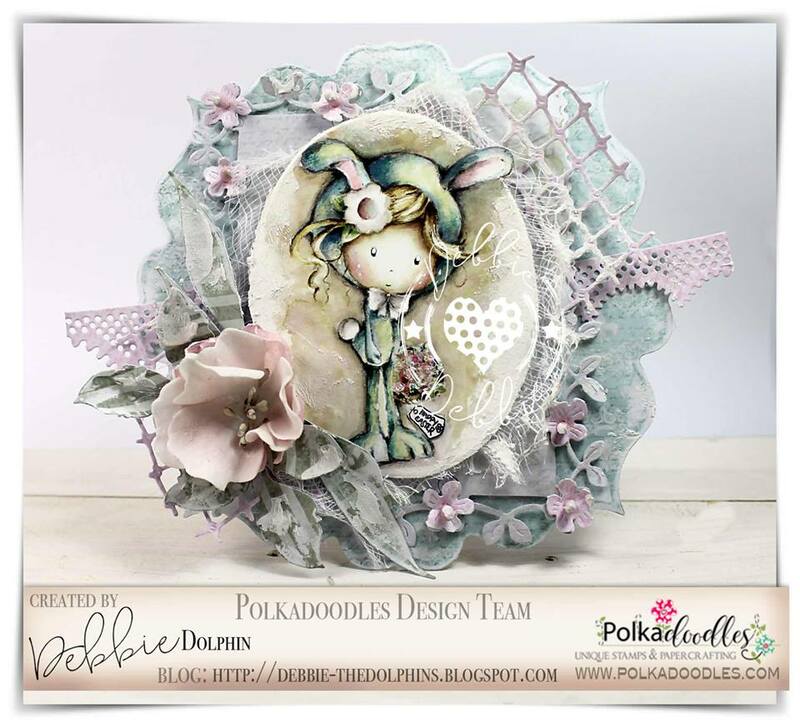 Suzi I've created a pretty spring shaped card using sweet Bluebell The Darling Buds Collection , papers are from Lil Miss Sugarpops Distress Ink Papers Sentiment and Flowers are from the Clear Polymer Stamps PD7539 Heart Sing. 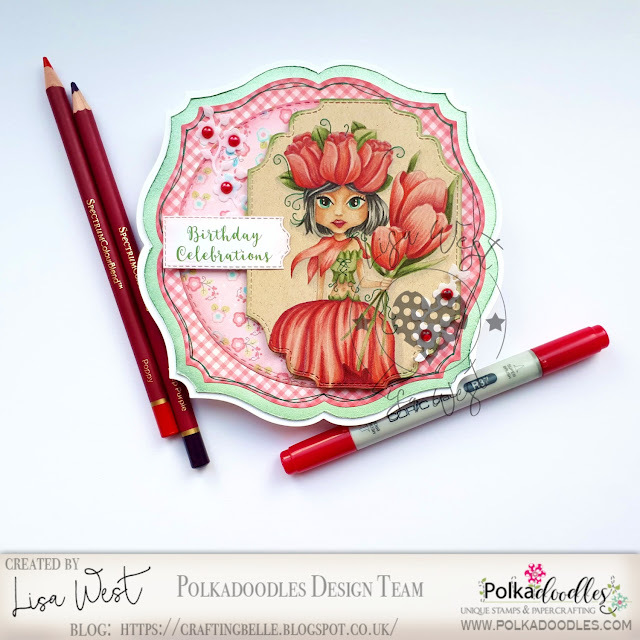 Lisa - I have made a shaped birthday card using Darling Buds Tulip digital stamp and digital papers from Winnie Celebrations 2 Papers 1. I've coloured the image on Kraft card using a mix of alcohol pens and pencils. Ann-Marie - I have used the beautiful Primrose from The Darling Buds collection for my make this week. I coloured her in pencils for a change in lovely fresh spring colours. 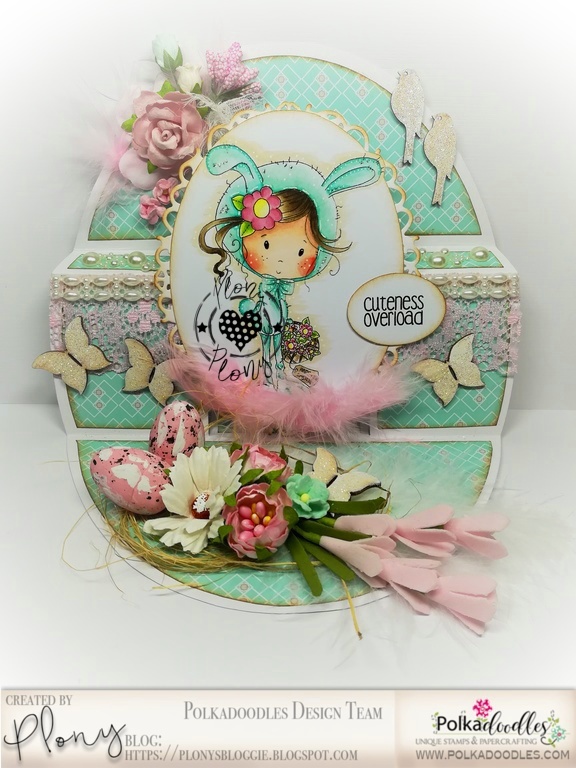 The pretty paper under the layers is from Winnie Sugar Sprinkles Paper Heaven 2 printed on to Ultimate Graphic Paper and the sweet sentiment is from the Serenity Fairy Wishes sentiment bundle. 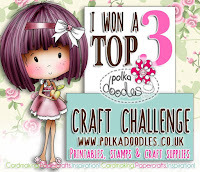 Claims must be received by 15/4/19, please refer to Challenge rules at top of blog. 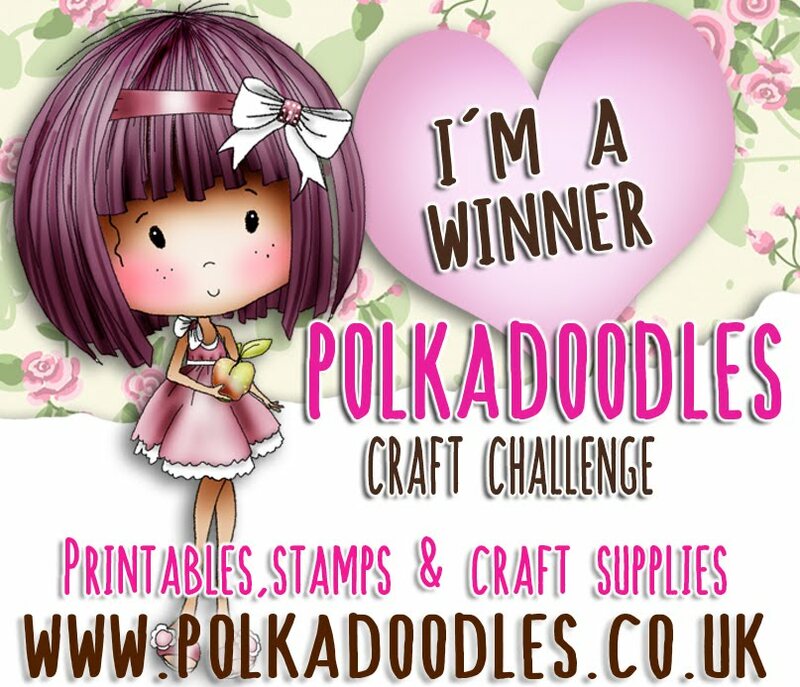 Closing date for entries:5th April, Noon. Nelly My project for Easter always has to involve chocolate of some kind so using Cherry Blossom Lane CD Collection I printed and fussy cut many elements and design papers images and created a Dispenser gift box. 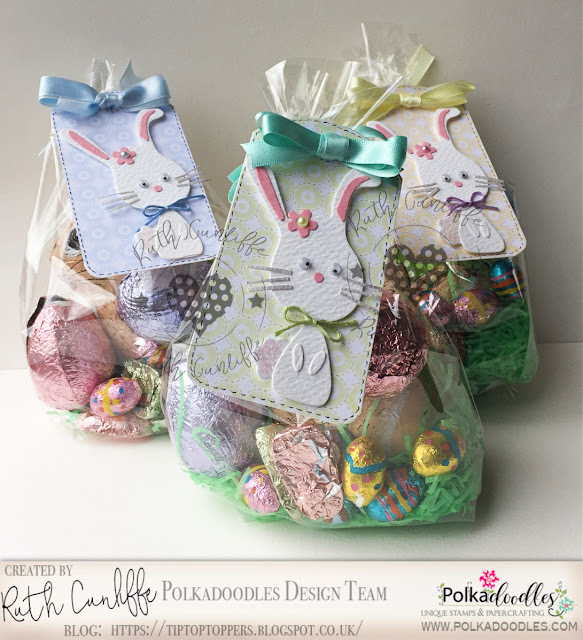 this a a Fabulous collection if your looking for inspiration to create Easter Gifts and very versatile for all occasions. Cat: Today I have used Winnie sugar sprinkles Springtime- Happy Easter! digi stamp and coloured with Oil Pencils. 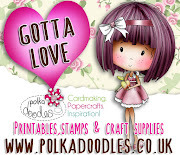 For the backing paper i have used 'Opera Girl themed paper and Eden Collection -Paper Heave 2. 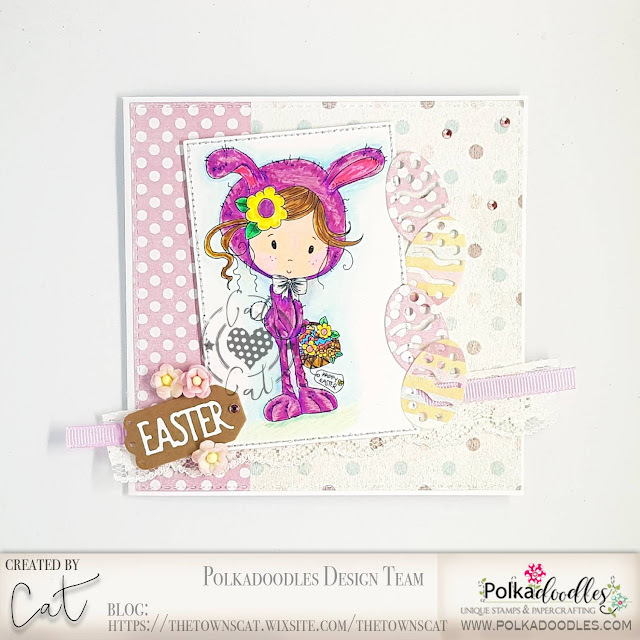 I have completed the card with some ribbon and lace and die cut Eggs from the paper packs above. Happy Easter all! 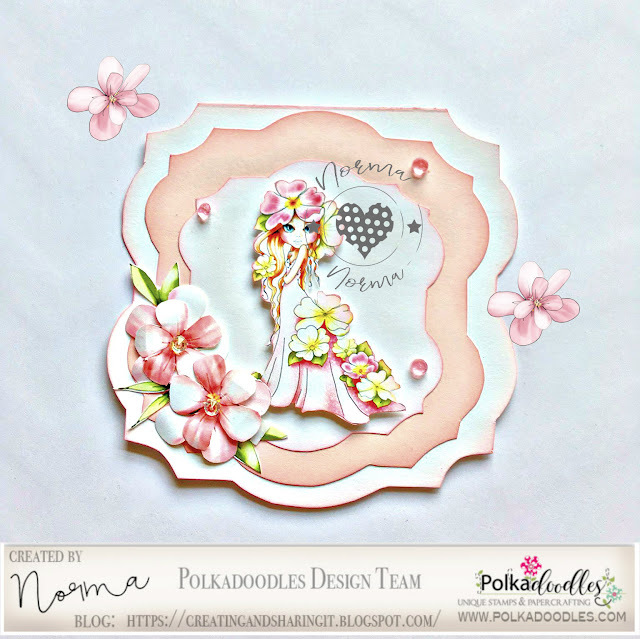 Judy: My card for this week was created using 24 Carrot Friend Clear Stamp Set.The sentiment was stamped using Believe in Angels Clear Stamp Set and my flower embellishmentswere die cut using Fancilful Circles Nested Die Set. Beata: I've made an Easter card with nest and eggs. Rather simple with flowers and twine. Background is made with Helga Hippo Paper Heaven 1. It's really great with all those flowers on it. Ruth: I've used the cute Cottontail Bunny Rabbit die and made up these Easter gifts for my three nieces. For a bit more cuteness I've added googly eyes. Papers from a now retired Candy Doodles which I found when searching my stash for something else! Not wanting to throw them away, I've made use of them!